Dear speakers, friends and everyone interested! 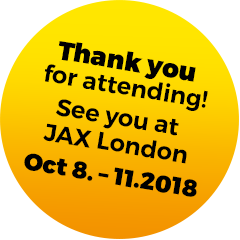 We’d like to invite you again to submit your proposals for talks and workshops for JAX Finance 2018. The conference will take place in London again and focuses on the specific technological needs of the financial industry. Topics such as low latency, messaging, exchange architecture as well as core Java technologies and continuous delivery are at the heart of this conference. Additionally, this year, we introduce a fintech-dedicated track underlining our mission to deliver cutting-edge innovation. Practical knowledge, inspiration and creation – this mix of perspectives distinguishes JAX Conferences and is the key to their success. We are looking forward to your exciting submissions. Did you know that JAX DevOps is taking place parallel to JAX Finance? Interested to contribute to JAX DevOps? Make sure to check out JAX DevOps and send your session application here.